Samsung, a worldwide leader in camcorder innovation, propels the DVD camcorder market to new heights with an advanced new model, the Samsung SC-DC565. The Samsung DC565 offers compatibility with all key single layer DVD formats as well as dual layer +R disc, an industry first. The new Samsung SC-DC565 will be on display during CES 2006. The 2005 CES Innovations Award-winning SC-DC565 is designed for consumers who want a high-quality, full featured DVD camcorder that allows for convenient, direct recording to high-capacity, single and dual layer DVD discs, as well as compatibility with the most popular memory card formats. 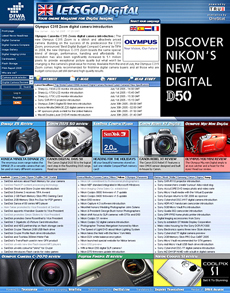 The Samsung DC565 will be available in March 2006 with a retail price of $599.99. Samsung DC565 DVD camcorder - 1 Megapixel CCD - The Samsung SC-DC565 combines a 1.1 Megapixel DVD camcorder with a 2.7 inch wide LCD for impressive image clarity and usability. The Samsung SC DC565 camcorder works with DVD-R, DVD-RW, DVD+RW and DVD+R single layer formats plus DVD+R Dual layer format providing consumer convenience and flexibility. Also, the 4-in-1 memory card slot is compatible with the leading memory card formats: Memory Stick, Memory Stick Pro, MultiMedia Card and Secure Digital cards. Samsung SC DC565 - MPEG4 video &Recordable media - The 26x Optical Zoom (a world best) / 1200x Digital Zoom and industry-leading 10-second power-on and lead time let consumers shoot high quality video in an instant. The Samsung SC565 records and plays high quality MPEG4 video (720 x 480/30fps) in true 16:9 wide-screen format and also includes a DVD-RW disc bundle for added convenience. "Samsung is proud to offer consumers the broadest format compatibility and choices in a DVD camcorder," said Aaron Novak, Marketing Manager for Camcorders, Samsung Electronics America. "Today's consumers don't have time to worry about which DVDs will function with their camcorders so Samsung has eliminated that concern. 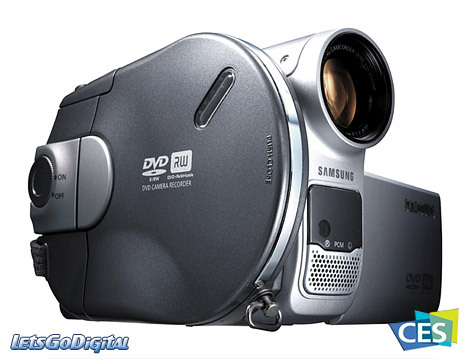 Our 2006 DVD camcorders epitomize Samsung's response to customer needs with the best available DVD format compatibility, superior memory card compatibility and the shortest power-on time." About Samsung Electronics - Samsung Electronics Co., Ltd. is a global leader in semiconductor, telecommunication, digital media and digital convergence technologies with 2004 parent company sales of US$55.2 billion and net income of US$10.3 billion. Employing approximately 113,600 people in over 90 offices in 48 countries, the company consists of five main business units: Digital Appliance Business, Digital Media Business, LCD Business, Semiconductor Business and Telecommunication Network Business. Recognized as one of the fastest growing global brands, Samsung Electronics is a leading producer of digital TVs, memory chips, mobile phones, and TFT-LCDs.